MercatorNet: Modern technology: triumph or tragedy? Modern technology: triumph or tragedy? Engineers sometimes get bad press, but where would we be without them? For almost ten years, I have written a weekly blog commenting on technology and engineering topics that make the headlines. Headlines are usually about bad news, or at least potentially bad news. So a reader of my blog might get the impression that I think technology is a net loss to society, and we'd be better off living in tents and herding sheep, or whatever our distant ancestors did to keep alive. 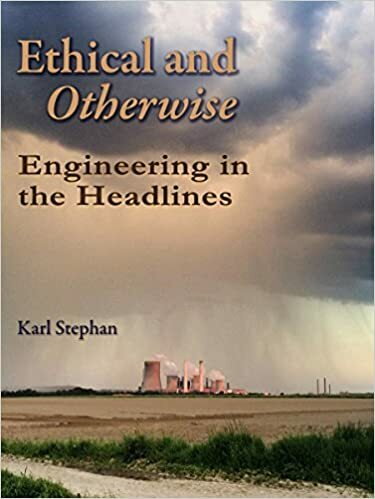 But ten years of reviewing what goes wrong with technology has taught me three things that became obvious as I selected some of my more popular blog articles for an ebook collection called Ethical and Otherwise: Engineering In the Headlines. In no particular order, here they are. 1. Human nature doesn't change. Take a farmer from the Middle Ages—say 1250 AD—and plop him down in the middle of Houston or Melbourne. Virtually nothing he would see would look familiar or even understandable to him. The tall, boxy buildings covered in acres of glass, the hurtling chariots of steel propelled by unseen forces, and the giant metal birds roaring high overhead would probably terrorize him. The only living thing he would probably recognize is people. Like him, they eat, sleep, go to the bathroom, and live their lives in patterns that may look radically different from previous centuries in some ways, but have much more in common with their ancestors than you might think. The typical modern person tends to believe that previous generations were so primitive, unenlightened, and ignorant that for all practical purposes they were a fundamentally different kind of creature from us. Historians call this way of thinking "Whig history," from the name of the liberal English political party. Whig history maintains that the curve of history is ever upward toward better living for everyone, and the latest of whatever you're talking about is inevitably the best there is. But when I review the disasters, ethical lapses, business failures, and other issues that I selected for Ethical and Otherwise, I see a great underlying continuity with life as it was lived a century or a millennium ago. Did you know there is an engineering ethics case history in the Bible, reported by Jesus himself? In Luke 13:4, Jesus is answering a question about why bad things can happen to good people, such as some Galileans who had been killed by the Roman occupying forces. As an example of sudden and apparently undeserved death, he refers to ". . . those eighteen, upon whom the tower in Siloam fell, and slew them, think ye that they were sinners above all the Galileans, because they suffered such things?" If he were here today, he could just as easily point to the 2007 Minneapolis bridge collapse that killed 13 people who were innocently commuting to work that day. People asked the same sorts of questions then as they do now. In the words of the 17th Century sage Blaise Pascal, human beings have always been a unique combination of angel and beast. In our plans and ambitious technological achievements, we reach for the stars, striving for a creativity that is almost God-like. But in our oversights, errors, and deliberate wrongdoings, we sink to the level of beasts that have no true choices, only instincts. Everything I have written about engineering gone awry can fit somewhere between the two poles of the angelic and beastly in humanity. And so in a fundamental way, it's very clear to me that the human nature Pascal commented on is very much with us today, though the ways we do things and the comforts of our daily lives may be vastly different. 2. Technology is changing our lives faster than ever. This sounds like the very Whig history I was criticizing earlier, but it isn't if you realize that change does not necessarily equal improvement. Here are three examples that show how much faster technological changes can happen these days than just a few decades ago. In 1907, less than one out of every ten households in the US was supplied with electricity. It took until 1949—42 years, more than a generation—to turn that statistic around so that nine out of every ten houses were wired for electric power. That was in one fairly advanced country. Today's global economy can do the same for the entire world, and faster. The first mobile-phone networks for use by the general public were introduced around 1980. By now—35 years later—experts estimate that nearly everyone in the world either has a mobile phone or knows someone who has one. And if we restrict our gaze to the cyberworld, the world of bits instead of atoms, the world's premier search-engine provider Google was founded only in 1998, back when things like paper encyclopedias, catalogs, and telephone books were alive and well. In less than 20 years, Google and its ilk have revolutionized the way most people in industrial societies search for information. Most of your time is spent either working, or doing whatever else you like to do instead of working. The increasing pace of technological change has had profound effects on both of those realms. Traditional societies centered around agriculture can employ almost any able-bodied person and pay them enough to get by on, if not to prosper. But the globalization of markets, the rapid exchange of trade information, and the rise of international capitalism as a force greater than that of many governments means that no one can ignore world markets and their effects on local businesses. Technology—by which I mean computers, communications systems, and the human organizations that build and use them—has both created a demand for what futurist George Gilder calls "symbolic manipulators" (engineers, accountants, screenwriters, etc.) and has begun to replace not only manual labor, but increasing numbers of lower-level white-collar jobs as well. Automatic dialing eliminated the thousands of telephone-operator jobs in the 1960s, but computer-aided phone banks created boiler-room operations in which people were paid to pester other people by phone eight hours a day. But more recently, voice-recognition technology is advancing to the point that most of the time, when you pick up the phone it's a computer, and when you dial a company you get another computer. So now even the old boiler-room jobs are getting harder to find. Technology has profoundly changed the way we spend our leisure time as well, starting with radio, then television, then the internet, smart phones, and so on. It has both isolated us—how many couples have you seen seated opposite one another at a restaurant, each gazing lovingly into the screen of his or her smart phone?—and brought us together. Teenagers can text with their buddies from the time they open their eyes in the morning till the time the phone falls out of their hands late at night and they drop off to sleep. Capitalism's demand for continual market growth makes novelty a kind of constant in today's cultures. I don't know if there is a speed limit out there for how fast technology can change our ways of doing things, but if things keep on changing faster and faster, we may find out what it is. 3. For most people most of the time, engineering is a blessing. I said at the outset that I don't think we should dispose of advances in technology and go back to Nature, and I meant it. The fact that most people in the entire world now have access to mobile phones is itself a welcome development for the vast majority of citizens. It means you can call for help in a medical emergency. You can keep in touch with your relatives and friends while traveling. You can buy and sell and trade and look for work and do all the things by phone that are so familiar to those of us in more developed countries that they are second nature. Together with access to modern technology comes increasing prosperity. There are many ways to estimate how well off the world's population is, and one of them is gross domestic product (GDP) per capita. This measure ignores many things such as time expended in domestic work and subsistence farming, but it does indicate how much cash a typical person has, and with cash comes a certain measure of freedom and well-being. A chart by Max Roser shows that it took from 1913 to 1964—50 years—for average world GDP per capita to double. The next doubling only took from 1964 to 2008—less than 38 years. More remarkable than the increased rate of increase is the fact that globally, on average everyone is getting richer instead of poorer. Yes, a very small percentage are getting disgustingly rich, as the income-inequality people like to insist. But there is nothing natural or automatic about increasing prosperity—it takes intention, organization, political stability, and a lot of work by a lot of people to achieve. And without the technological advances of the last few centuries, it is very unlikely that much of this increase could have happened. As long as engineers devise more and newer technologies, there will be mistakes, accidents, and wrongdoing. And there will be headlines, which means I don't have to lay awake nights wondering if I'll have something to blog about next week. I always do. But just because there is bad news all the time about engineering and its products, don't let that make you think we'd be better off without it. We wouldn't be. Karl Stephan blogs on engineering ethics and related topics weekly at Engineering Ethics, and several of his blog articles have been republished by MercatorNet. His ebook Ethical and Otherwise: Engineering In the Headlines was released Dec. 7 and is available in Kindle format and also in the iTunes store. This article is published by Karl D. Stephan and MercatorNet.com under a Creative Commons licence. You may republish it or translate it free of charge with attribution for non-commercial purposes following these guidelines. If you teach at a university we ask that your department make a donation. Commercial media must contact us for permission and fees. Some articles on this site are published under different terms.